This Week, The Dixie Chicks Mattered. It’s been a pretty polarizing week, eh? Aside from all that election business, the country was also divided during the CMA Awards, where fellow Texans the Dixie Chicks and Beyonce teamed up for a performance of the latter’s “Daddy Lessons.” And by “country” we mean “country music fans.” And by divided, we mean they acted like racist fools. 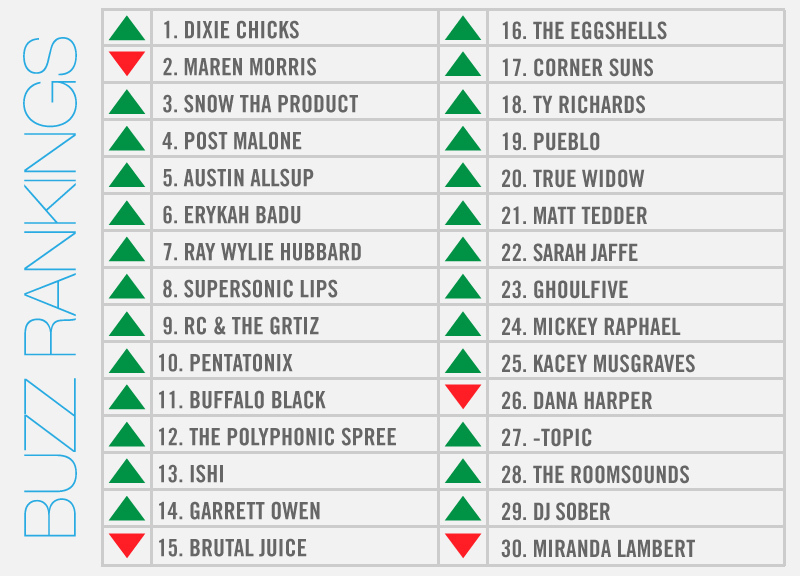 Good or bad, it’s helped the girls’ names stay in the news a whole ‘nother week, finally netting them their first-ever trip to the top of our weekly, local music power rankings. What’s more, their fellow performers at those awards –Maren Morris, Kacey Musgraves, Miranda Lambert, Pentatonix and Mickey Raphael — also earned spots this week. Also on TV, another country performer from around this way, one Austin Allsup, continued his run on The Voice. And Erykah Badu taped her second straight hosting gig at The Soul Train Awards, which will air on November 27. Elsewhere: Ray Wylie Hubbard’s in town celebrating his 70th birthday; RC & the Gritz dropped its new album; the SuperSonic Lips were crowned the champs of Ninkasi Brewing’s summer-long battle of the bands; Snow tha Product headlines Trees; and Buffalo Black helped us throw an election party.